Default price would be used if takeaway price is set to 0.00. 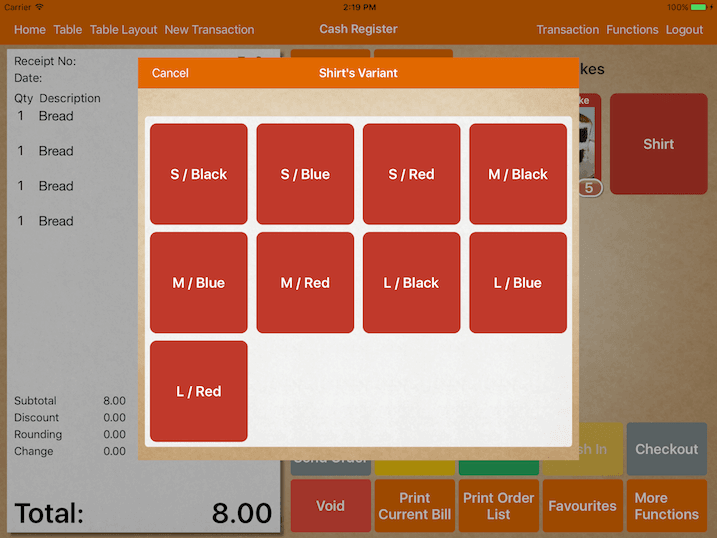 If takeaway price is setup, transaction with no table assigned will use the takeaway price. Enter the price of item upon ordering. MobiPOS supports all bluetooth barcode scanner that work with iOS devices. Setup item with barcode, and by scanning them will add the item into bill. Typically there's two type of barcode scanner in the market, one has an eject button which will allow you to pop the iPad keyboard when its necessary. The other type without this ability, you are required to turn off the bluetooth scanner in order to use the iPad keyboard. Generally barcode scanner with eject button is much more expensive. For variable pricing item, system picks up the weight or price automatically for EPC12 and EAN13 barcode. For example a 13 digit EAN13 barcode '0 212345 100202', system will search for item with the barcode of '12345'. If item is setup as weight(kg), it will be keyed in as 100.20kg. If item is setup as open price, it will be keyed in as $100.20. For 12 digit EPC12 barcode of '2 12345 10020 2', again system will search for item with the barcode of '12345' but register the price or weight as 0.20. For certain barcode scanner, it is not able to pickup the first '0' digit in the barcode. Instead of '0 212345 100202', scanner register it as '212345 100202', hence affecting the pricing of item. To fix this, go under our login page, key in '123456786886' as your password and click Login. A message will pop up saying 'Scanned barcode now adds 0 in front'. To disable, key in the same code of '123456786886'. Assign as many modifier group to the item. Start by creating modifier group under modifier group. 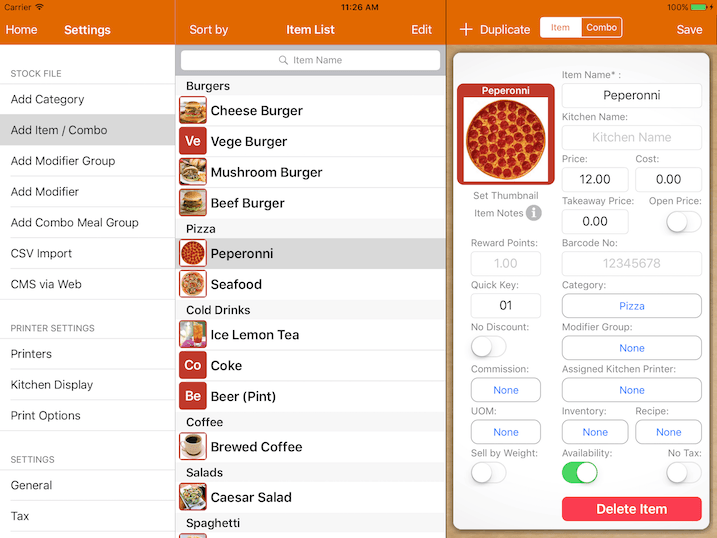 To delete the modifier from the item, swipe across the item's modifier. If no printer is assigned, item follows the settings of its category assigned printer. If both category and item assigned printer is assigned, item assigned printer will be used. 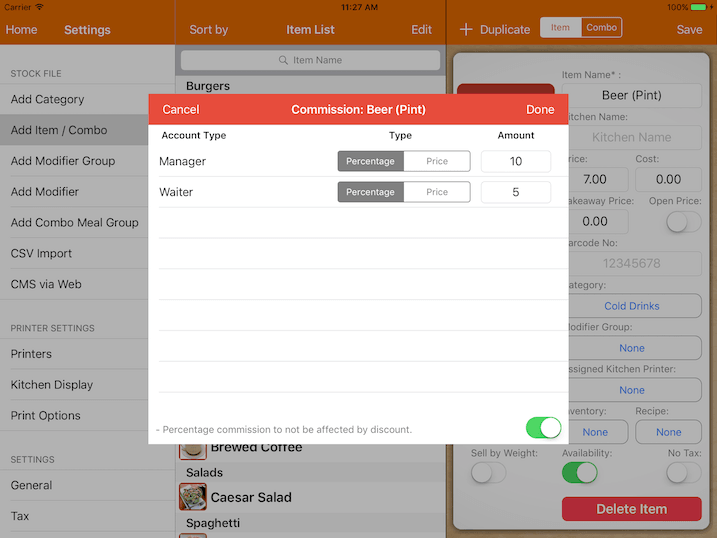 Each item can be configured to have different types of commission, by price or percentage. If multiple account type is setup, depending on the logged in account, their commission would be different. Commission by price will not be affected by discount or price overwrite. Commission by percentage will be affected if there's discount by default. Turn off the switch at the right bottom, so it will always be calculated based on the full price amount. Inventory will be deducted each time an order is sent to the kitchen. Inventory will be recovered each time an order is void. 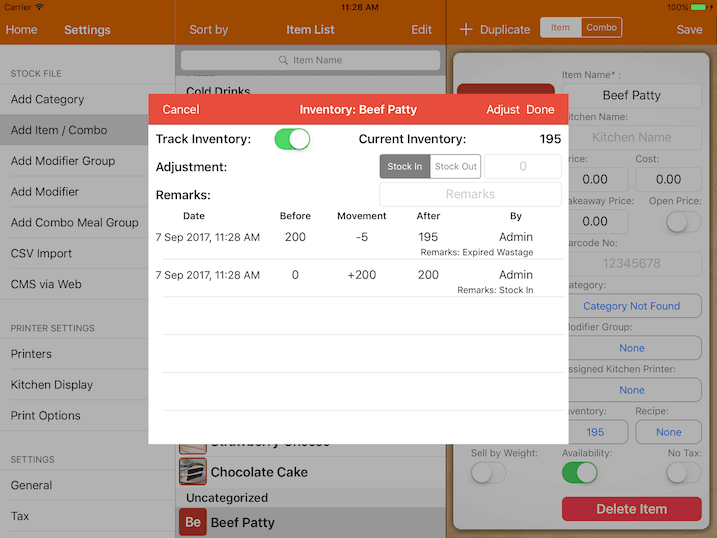 Perform stock in/stock out to track inventory movement. Inventory can be in decimal unit. 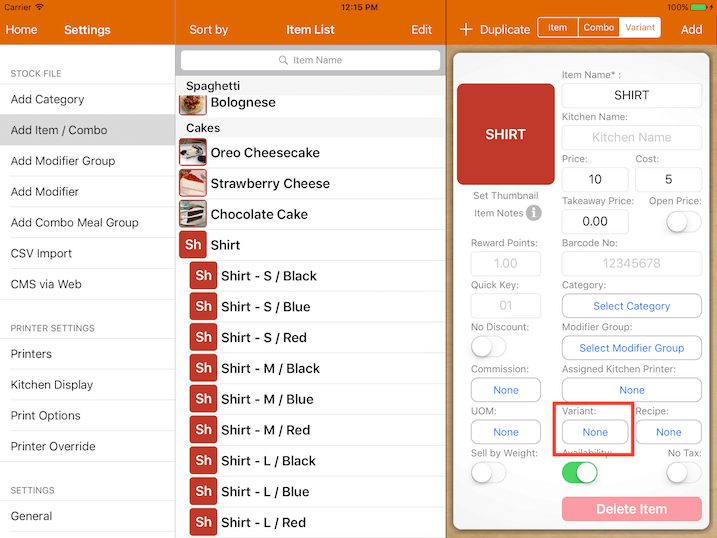 If no recipe is assigned to an item, inventory will be deducted according to the quantity ordered. 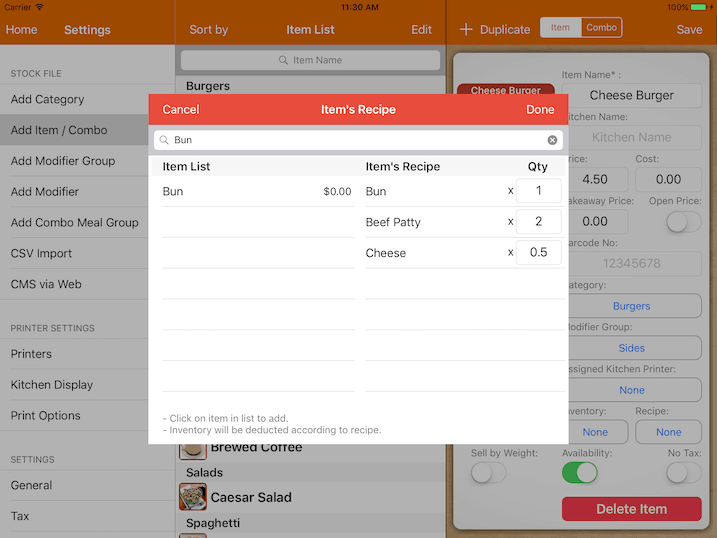 With recipe, it will be deducted based on the recipe you supply. Key in the item name in the search bar to search and add them into the recipe list. Below is an example of a cheese burger's recipe. 1) Selling beer in the form of bucket or bottle. Ultimately you will want to keep track the number of bottles you have. In this situation, you will need to create 2 items for sale, one as bottle of beer and another one as bucket of beer. For bucket of beer, set it's recipe to deduct 5 x bottle of beer and as for bottle of beer, no recipe is required. Whenever you sell a bucket of beer, it will deduct 5 quantity from the bottle of beer, and selling a bottle of beer will deduct 1 quantity away from it's own inventory. You will perform stock in/out on the bottle of beer item only. 2) Selling wine in cup of different sizes or bottle. The best approach is to set the base inventory of the wine as litre or ml. Whenever you sell a cup of wine, you could deduct either 0.175 litre or 175 ml from the wine inventory depending on your setup. Turn off to disable ordering temporary. Disable this item from charging tax. Turn on to disable discount on this item, applies for both bill and order level discount. 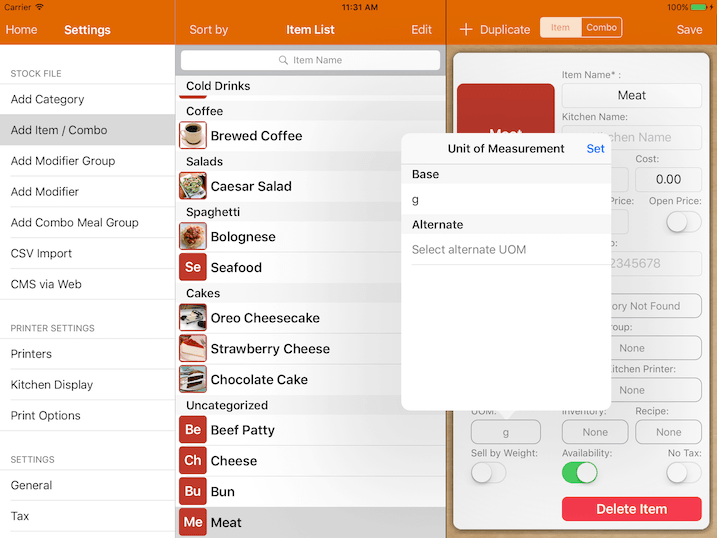 Recipe or notes for the item, will be displayed in KDS. Points rewarded to customer if loyalty is enabled. Turn on Sell by Weight in order to sell your product by weight. However base unit of measurement has to be assigned first. Alternate unit of measurement is optional unless you are performing stock in/out with it. Setup unit of measurement under Settings -> Unit of Measurement. To add variants for an item, user has to first add attribute. Kindly refer to Attribute guide. To create items with variants, go to Settings -> Add Item/Combo. At the top right corner of the page, select the "Variant" tab. Insert the required information of the item. Next, click on "Variant" column at the bottom right as shown as below. 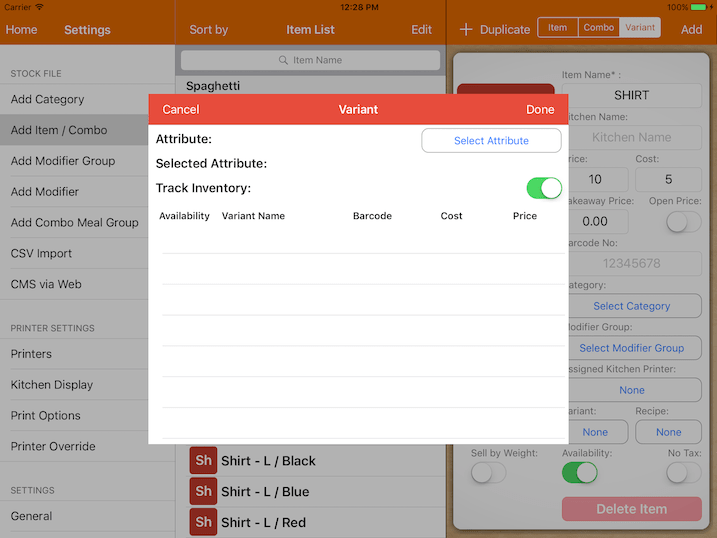 After that, tap "Select Attribute", then choose the desired variants. If there is different pricing for different variants, it can be edited individually as shown below. Do note that all the information entered at the main item will be the same for all the sub items that fall under it. For example, when the pricing is set at $10 under the main item, all the variants will automatically be set at $10 as well. Any changes made at the main item will be affecting its variants if they are identical previously. Eg. If the cost price is initially $10 and it is changed to $15, only its variants which are priced at $10 will be changed to $15. The variants that is different from its main item will remain unchanged. Ordering variant item will be shown as below after it is done setting up.